Boss RC-30 Review – based on Question/Answer format so you can skip around to what you care about. Feel free to post questions or answers below the review. Competitive Position: The price of the RC-30 is comparable to the VOX VDL1. We believe the RC-30 is far better suited for home use due to it’s memory capacity and USB interface. However, the VOX device is better for live performance. 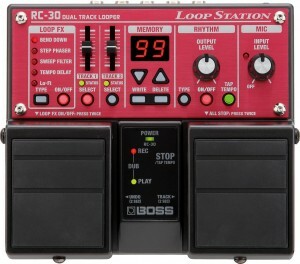 What is the price I should expect to pay for the BOSS RC-30 and how does that compare to other loopers? What is the main function of the BOSS RC-30? The main function of the RC-30 is looping. It includes many looping features, and also includes dual-track (too loops in parallel), stereo looping, and some effects. Can I record sound, continuously play a loop of that recording, and then layer additional tracks over the loop/phrase with the BOSS RC-30? Yes, the RC-30 has basic looper functionality with unlimited overdub, controlled via footswitch. The process is to start recording, then < press Left Pedal> to begin looping what you have recorded and recording overdub, then to play the loop. You can continue to add layers by or to stop the playback. You can also set the device so that the process is Record -> Playback -> Overdub, which is the most common operation sequence for loopers. How long can I record with the BOSS RC-30? The RC-30 can record 3 hours. You can also back up files via USB onto your PC to free up memory. Also, the minimum record time is 1.5 seconds. How many memory locations (slots) are included in the BOSS RC-30? The RC-30 has 99 slots. Using the BOSS RC-30, can I learn by having an instrument teacher play something and then slow it down and work on matching the notes and gradually speeding up? Yes, the RC-30 has tempo control, where you can slow down or speed up the music and it’s a good way to learn a new song. Can I practice soloing with the BOSS RC-30? Yes, you can lay down your own rhythm tracks and then play over the top of them, or you can use one of the 9 pre-loaded rhythm tracks. Or you can use the 1/8” Aux Input to play a song through the RC-30 and then practice soloing over that. Can I use the BOSS RC-30 to capture quick song ideas to review later? Can I switch to a different loop/slot while performing with the BOSS RC-30? Yes you can, and you can accomplish this hands-free. 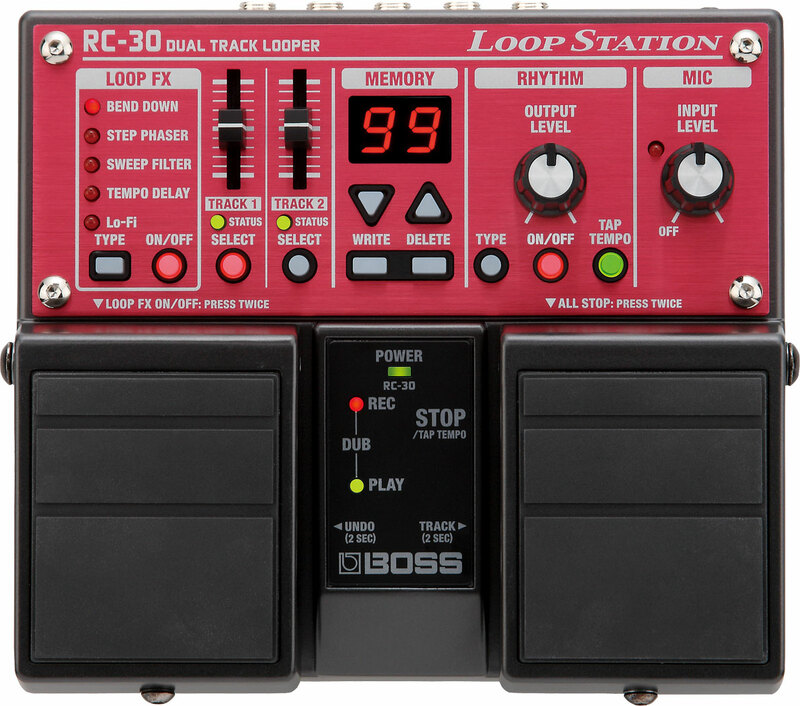 Can I perform loop-to-loop queuing with the BOSS RC-30? Yes, the RC-30 has this feature. Loop-to-loop queuing is when you are playing a current loop/slot and you switch to the next loop/slot without stopping the current. Then, when the current loop completes a playing cycle it automatically switches to the new loop you have selected. Can I switch back to the previous loop with while performing with the BOSS RC-30? The best way to accomplish something close to this is by using the two tracks. Each of the 99 memory slots has two tracks within it. Therefore, you could start recording on Track 1, then add Track 2 and bring it in and out of the song or mute the Track 1 or 2 playback with the volume sliders. If you want to switch to another memory location, though, then you need to save the loop prior to switching or you will lose it. This is done by pressing the “Write” button twice by hand. However, you can’t save unless the playback is stopped. So, you would need a section of your song that isn’t reliant on the looper. Also, be aware that there is a slight delay that occurs when switching from one slot to another. With the BOSS RC-30, can I record and play different parts of a song (verse, chorus, bridge) all during a live performance while not using my hands (pedals and footswitches only)? Theoretically you could but you would need to save any loop if you wanted to come back to it later in the song, which you can’t do while it’s playing. Also, you have to deal with the delay when switching from loop to loop. You could do a combination of undo/redo and use the two tracks within a single memory slot to get close. However, the two tracks need to be the same length. Can I go from recording directly into overdub with the BOSS RC-30? Yes, you can go directly into overdub with the RC-30. Can I undo/redo the last overdub to change the song or eliminate a recording error with the BOSS RC-30? With the RC-30, you are able to undo the last overdub and also redo the last undo. Can I set previous layers to go quieter or fade out while overdubbing new layers with the BOSS RC-30? This function is called “Decay” by Boomerang, “Recorder Overdub Level” by Line 6, “Loop Aging” by Pigtronix, and “Feedback Decay” by others. It is used to gradually or quickly transition a song without stopping or switching your ongoing loop. However, it is not available on the RC-30. Can I adjust the volume or effects of individual overdubs with the BOSS RC-30? There are individual volume controls for the two tracks that make up each memory slot. This volume controls the level at which the track is played back. Therefore, you can make the play back quiet and the live sound loud or visa-versa. Can I record individual overdubs/layers as individual WAV files with the BOSS RC-30 to then work with in a DAW? Yes. With the RC-30, you can save each track as an individual WAV file. Therefore, you could save off one overdub at a time on track 2, for example, while track 1 plays the rhythm. Can I use the 1/8” AUX input to play song into the looper and incorporate it into my loop with the BOSS RC-30? Can I pre-record tracks, edit them in a DAW, load them into the BOSS RC-30 as loops and then trigger them with the footswitch when needed? Yes, the RC-30 is set up to take WAV files via USB. The loop file format is 44.1kHz, 16-bit stereo. Can I trigger a one-shot playback (a.k.a. single phrase) with the BOSS RC-30? In other words, can I set the loop to only play one time when triggered? Yes, this single phrase functionality is available on the RC-30. This is controlled via a Stop Mode setting. Can I play multiple loops simultaneously with the BOSS RC-30, and turn them on and off? For example, play drums on one track, base-line on the other, and guitar on another and bring them in and out of the song? Yes, you could do a combination of undo/redo and use the two tracks within a single memory slot to accomplish this. Can I play a loop or overdub in reverse with the BOSS RC-30? No, there is no reverse function in the RC-30. Does the BOSS RC-30 have stereo sound or just mono? The RC-30 has stereo sound. Is there anything in the BOSS RC-30 that reduces the clicking sound that can occur when tapping the footswitch during overdub? Not that we are aware of, but pedals are typically quieter than footswitch press buttons. However, it could still be an issue. Is the BOSS RC-30 a good looper for live performances on stage? The RC-30 could be used for on-stage performance. There are several complaints, in public forums, about the split second delays that can occur when switching between loop slots. However, you use it for a more limited set of features. The unit is known to be relatively stable and trust-worthy. That being said, we think the RC-30 is better for home use. We like this model’s functionality for composing new songs, editing, porting to a DAW, practicing, learning and video performances. Are there multiple stop modes in the BOSS RC-30? Yes, there are four modes that you can assign to a memory location’s track. It can be standard mode, one-shot playback (no overdub or repeat), fade out stop, or loop play (which plays to the end of a phrase after stop pedal is pressed). However, keep in mind that you have to assign these settings to saved tracks. Difficult to perform this in a live setting. Can I stutter start with the BOSS RC-30? No, we are not aware of any way to stutter start with the RC-30 unless you add those effects to a WAV file within your DAW and then import via USB. Can I resample with the BOSS RC-30? In other words, can I take a loop and modify it by multiplying it, cutting part of it out, adding a different effect to it, etc? No the RC-30 does not have multiply or any other resampling functionality. Can the BOSS RC-30 be set to auto-record when I begin playing? Yes the RC-30 has auto-record. With the BOSS RC-30, are there any issues with droning (playing the same note, chord, repeated sounds, or tone-clusters continuously) at the boundaries of the loops – such as noticeable change in volume? We have not experienced or heard of an issue with droning using the RC-30. Does the BOSS RC-30 have a built in metronome? There are ten rhythm tracks that are pre-loaded into the RC-30. You can adjust the tempo and use as a metronome. Is there any software that comes with the BOSS RC-30? No, there is no PC software that is made available specifically for the BOSS looper pedals. Is quantize functionality available on the BOSS RC-30? Yes, the RC-30 operates in auto-quantize mode while a Rhythm track is playing. Will the BOSS RC-30 interface with my DAW (digital audio workstation)/computer through USB? The RC-30 does not function as an audio interface. The USB is only used to transfer the loop files, not stream the audio output to the DAW. Will the BOSS RC-30 interface with my computer through USB to transfer sound files? Yes, the USB port on the RC-30 is used to transfer files. Many other loopers on the market do not have this functionality. Can I save and recall loops with SD card with the BOSS RC-30? There is no SD card slot on the RC-30. Does the BOSS RC-30 have effects (FX)? Yes, the RC-30 has five built-in effects (FX). However, it is not on the live signal, only the playback. Can I bypass the effects (FX) with the BOSS RC-30? Yes, there is an on/off button. Also this can be controlled via optional footswitch. Can I turn off or mute the live signal that is fed through the BOSS RC-30 (for use in parallel effects loops of an amp or in Aux Send/Return of a mixer)? Can I save presets for effects with the BOSS RC-30? No, the effects are on/off only. Does the BOSS RC-30 have an XLR mic input? Does it have phantom power for a condenser microphone? Yes, the RC-30 has an XLR input, and unlike almost every other looper it DOES include phantom power. Does the BOSS RC-30 function as a mixer with multiple inputs? Can I re-assign footswitch functionality with the BOSS RC-30? The RC-30 has two pedals. The functions of the pedals can be changed in that you switch the order of record/overdub/playback that is triggered by successive taps of the left pedal. There are two settings: record/overdub/playback (default) and record/playback/overdub. Does the BOSS RC-30 have a headphone jack for playback and monitoring? No, the RC-30 does not have a dedicated jack for headphones. Can the BOSS RC-30 be connected to an external MIDI device? No the RC-30 does not have MIDI ports. Does BOSS release firmware updates for the RC-30? Is there an optional footswitch that I can add to the BOSS RC-30 to increase functionality? Yes, you can either add one FS-5U, two FS-5U’s, or one FS-6. One FS-5U will allow you to switch the current track between the two and allow you to shift the memory slot up. The two FS-5U’s function just like one FS-6. The functionality includes the single FS-5U and adds Loop FX on/off, memory slot shift down, and Loop FX type select. Is there an optional expressional pedal that I can add to the BOSS RC-30 to control effects(FX)? No, there is not a way to connect an expression pedal to the RC-30. Can the BOSS RC-30 be battery powered? Yes, it can use six AA batteries. How is the warranty for the BOSS RC-30? According to the Roland US site, the warranty is 5 years on parts and 2 years for labor on compact and twin pedals. What size is the BOSS RC-30? The RC-30 is fairly compact. It weighs 2 lbs. It’s footprint is 6.8” x 6.25” and is 2.25” tall. Also, keep in mind that the optional footswitch FS-5U is 4”x4”x2”. The FS-6 is 8”x4”x2”. Why is using a BOSS RC-30 better than just using computer software? Or why should I use a stompbox looper instead of something that is software based? Why is using a BOSS RC-30 better than just using an iPhone or iPad application? There is very limited functionality with the iOS based loopers compared to the BOSS RC-30. However, these apps are quickly improving. With added hardware (microphone, Bluetooth control pedal, etc. ), these setups may start to look attractive. Please see our iOS app setup information. What company makes the BOSS RC-30 and where are they located? There is a main manual on the RC-30, along with an addendum. There is also a very short playing guide. Through the BOSS website, there is a limited knowledge base that is not organized as a forum (like many other manufacturers have). BOSS and their reps are quick to respond and help, but difficult engineering questions are sent to Japan. The answers that come back are not always everything you need, from what we’ve heard. How long has the BOSS RC-30 been in production? According to this press release, the RC-30 was released, along with the RC-3, in January 2011. These devices are successors to the RC-20XL and RC-2. The RC-20XL was released on J uly 2004 (press release) as a successor to the RC-20, which was the original BOSS looper released January 2001 (press release). The RC-2 was released in July 2006 (press release). BOSS also began shipping the RC-300 in December 2011, which is probably the most feature-packed (and most expensive) looper station on the market (press release). That was a follow up to the RC-50, which began shipment in January 2006 (press release).